I'm currently in a bit in shock; in fact, I shed tears when it happened. After graduating with a degree in education 40 years ago, and spending over 36 of those years in public education, Monday was a new milestone for me... I submitted my retirement letter to our Board of Education, effective May 31, 2017. How is that possible?!! I have loved almost every minute of my career in education. It was never just a job for me; it was a passion, and still continues to be. So, what does this have to do with choosing my One Little Word for 2017? I've been thinking about a guiding word to help me navigate these new roads head, whatever they may be. I want to be present in all these "last" moments of my full-time career, and I also want to look ahead with excitement and expectancy to the new experiences that lie ahead. So many possibilities. 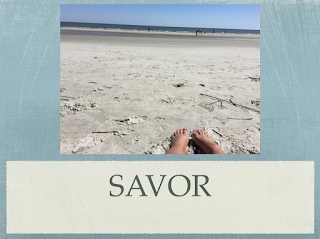 Several words crossed my mind, but I kept coming back to the same one: SAVOR. I want to savor the moments and memories and learning and collaboration with colleagues between now and May 25 (our official last school day this year). And as I embark on new journeys beginning June 1, I want to savor all the new possibilities that will make themselves known to me. I want to travel a great deal, do more writing, connect with friends and family regularly, give back by volunteering, stay open to part-time opportunities in education, spend more time on our screen porch, learn new things. I look forward to savoring all of life. Congrats on submitting your letter, my friend. Hope this means I will still be hanging out with you at NCTE! This as such an important time for you, and I LOVE that your word is savor. It's perfect. Wow -- congratulations!! This is so exciting -we cannot wait to hear about your next ventures and to read the words you choose to share. Talk soon!!! You need to connect with Deb Day, also retiring this year. It's a lovely and apt word for this special time, Karen. 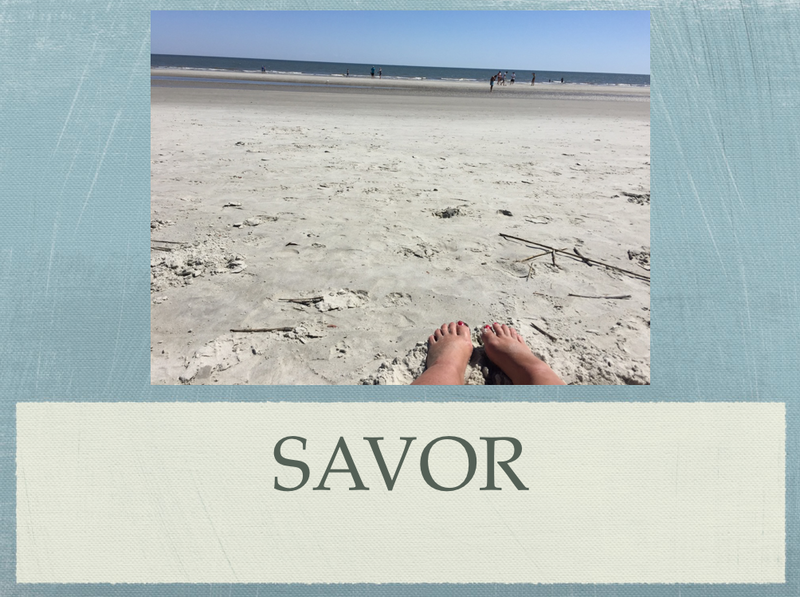 You'll "savor" these final months, and "savor" the next ones, too. Oh, wow, Karen! Congratulations! Savor the rest of these days, and savor the possibilities of all the wonderful things that will come after! I LOVE this OLW! I'm going to write it down as a possibility for next year. There's so much in life we can savor but forget to savor. 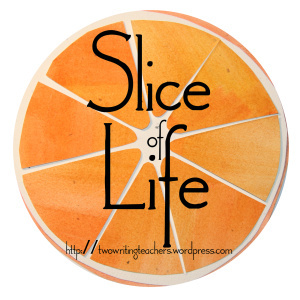 Good luck savoring your last few months of your teaching career and savoring your new normal! Congratulations on your coming retirement, Karen. I'm quite sure that you'll have a fascinating new journey ahead. And I love your OLW. Savor it all! Happy New Year! Wonderful word! I'm only two years in on teaching, so reading your reflective tone tells me how much I have to look forward to. I hope you savor every second and that it brings you joy. Congrats on your decision to start the next exciting stage in your life. Congratulations on 40 years of service and commitment to young people! You deserve to savor every moment. Wow, Karen. I'm sure it was a difficult decision, but looking ahead and savoring every moment will make this last year so amazing and special! Congrats and truly enjoy it! Savor, wallow, and enjoy! One step, one day, savor while you leave yourself open to the next adventure! You have made an impact on education! Congratulations Karen! I am excited for you as you embark on this next part of your journey. Enjoy these last months at school and savor every moment. Congratulations, Karen! I will always appreciate your kindness and generosity to me when we met at Nerd Camp. You champion and connect others in such an inspirational, open-armed way. Wishing you a wonderful, well-savored 2017. I think more time on your screened in porch sounds like he perfect idea. I know a few friends who are always happy to join. I know this word, and your decision, have not come easily. I just smile thinking of all the lives you have touched, all I have learned from you, and all the stories ahead.